Chika Kako, Chief Engineer of the UX said: "Right from the start, I focused on the target customer―mid-30s, millennials, men and women―and tried to understand how they would expect a luxury compact vehicle to change their lives and enable new experiences. That's what led us to the basic vehicle concept for the UX of Creative Urban Explorer―a new genre of crossover. "Design is still the main purchase reason for every car, it is the design that promises to the customer what the car can deliver. With the UX the design team have created a style which delivers the strong safe feeling that sets crossovers apart from hatchbacks, but combined it with a very dynamic dimension. "We also focused on giving the UX a distinctive driving feel that would resonate with the customer. I wanted to overturn the image of a crossover with a high body that requires careful manoeuvring and offer a car with nimble performance and excellent manoeuvrability that make it as easy to drive as a hatchback." This design approach can be seen at work in the way the front and rear wings flare strongly outwards in relation to the car's basic form, which flows out from the lines of the spindle grille to envelop the cabin. The meticulously formed exterior surfaces are simple but captivating, expressing strength and dynamism. At the front, the arrangement of the headlights and the spindle grille are incorporated into a deep, strong shape created by the hood and bumper to generate a sense of security. At the rear, a condensed styling treatment contrasts sharply with the flared wings to emphasise the UX's dynamic and strong crossover qualities. The rear combination lamps have an original and advanced design that is not only eye-catching but also aerodynamically efficient while improving vehicle handling. The right and left units are connected by a continuous, single line of light across the back door to give the UX's rear a unique appearance. Formed by a sequence of 120 LEDs, this tapers gently towards the centre, measuring just 3mm thick at its narrowest point. This design is set to become a world-first Lexus signature feature. The car's proportions allow for excellent manoeuvrability, with a best-in segment 5.2m turning radius. For the driver, a reduced distance between the hip and heel points gives the feel of driving a hatchback rather than an SUV-type vehicle. The interior of a car is the place where the driver and the car connect. As such, the designers sought to eliminate the boundary between exterior and interior, creating a seamless continuity. The effect gives the driver an excellent field of vision with a clear sense of the vehicle's body dimensions. This concept is most evident from the driver's seat, where the upper section of the instrument panel appears to extend out beyond the windscreen. Conversely, seen from outside, the hood looks as though it connects directly to the instrument panel. This is inspired by a traditional Japanese concept which blurs the boundary between the inside and outside of a house. The human-centred approach extends to the design of the UX's interior, with a "seat-in-control" concept that focuses operation of all the principal vehicle functions around the driver's side of the cabin. Chief Engineer Kako has drawn on her earlier experience in materials development and time spent working in Europe to help define the quality and appearance of the interior, in particular applying an uncluttered "less is more" approach to achieve the desired effect. She explained: "In the course of (my earlier) work, I learned that even if the elements that make up the interior, such as the seats, instrument panel and ornamentation, are all made to a high specification, that doesn't necessarily mean that the overall look will give an elegant impression. When it comes to determining whether an interior is good or bad, controlling the overall balance between the continuity, unity and contrast is more important than the relative specifications of individual components." The UX's sweeping instrument panel covers a large area, connecting the driver and passenger sides of the vehicle. This provides an opportunity to accentuate the atmosphere of the cabin using fine-quality ornamentation, with a choice of two grain patterns and four colours. The UX is the first Lexus model to offer a new trim grain finish that's inspired by the grain of Japanese paper,known as washi, familiar in traditional Japanese homes. Created using slush-moulding and a carefully chosen surface finish, it evokes a calm and warm feeling. The UX has been engineered to deliver "elegant performance with peace of mind" consistent in all Lexus models. The foundation is the new global architecture platform named GA-C, used for the first time in a Lexus. Two new powertrains make their debut: a new, fourth generation self-charging hybrid system with 178 DIN hp/131kW1 and the choice of front wheel drive or E-Four in the UX 250h; and a new 2.0-litre petrol engine with high thermal efficiency, available with a new Direct Shift continuously variable transmission in the UX 200. Suspension, steering and tyres have also all been developed to support Lexus' dynamic and performance ambitions for the UX. The UX is the first Lexus to be constructed using the new global architecture platform named GA-C, the foundation for the car's dynamic performance. Its development focused on giving the UX nimble and instant response to the driver's inputs, while communicating a sense of stability and safety. The UX has the lowest centre of gravity of any vehicle in its class, thanks to the design of the global architecture-C platform. This characteristic, central to the car's fine ride and handling quality, is also supported by weight-saving measures in the body construction, including the use of lightweight aluminium for the side doors, fenders and hood, as well as a resin material for the back door. 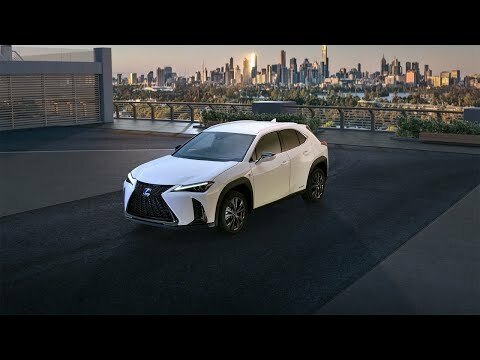 The Lexus UX 250h will also use a new fourth generation hybrid electric system that features a new 2.0-litre four-cylinder petrol engine and continuously variable transmission (CVT). It will be available both with front-wheel drive and with Lexus' E-Four. The powertrain development programme focused not just on outstanding fuel economy, but also on a high level of driving appeal. Particular efforts were made to reduce any "rubber band" effect in the operation of the hybrid system and transmission, by optimising the level of electric motor assistance and engine rpm to generate a linear acceleration feel without the engine running at high revs. Engine rpm are synchronised with the increase in vehicle speed to create an immediate and continuous acceleration feel, responding to the driver's intentions and creating a pleasant driving feel. A new nickel metal-hydride (NiMH) battery is used with a revised construction and more compact cooling system that allows for smaller dimensions overall. This allows the battery to be located below the rear seat, minimising intrusion in the load space and supporting the UX's low centre of gravity. The E-Four system gives the UX 250h all-wheel drive capability by placing an additional electric motor on the rear axle. Power distribution between the front and rear axles is automatically optimised when accelerating, cornering, or driving on slippery surfaces. When a loss of rear-wheel grip is detected, the amount of power that can be directed to the rear of the car has been increased from 60 to around 80 per cent, at speeds up to 70km/h, contributing to excellent handling stability. Features which enable this across a wide range of driving scenarios include multi-hole direct fuel injectors, a continuously variable capacity oil pump, a variable cooling system and VVT-iE intelligent variable valve-timing on the intake side. The result is a maximum thermal efficiency of around 40%―a best-in-class level for a passenger vehicle engine. The new 2.0-litre engine featured in the UX 200 is matched to Lexus' first Direct Shift-CVT, engineered to provide the smooth, fuel-efficient performance of a conventional continuously variable transmission, but with a direct driving feel. A conventional system uses two pulleys, connected by a belt, that can change their radius seamlessly, and thus change the effective gear ratio, without any "step" effect. In addition, this use of gears for acceleration from start-up reduces the need for the CVT's pulleys and belt mechanism to be used in the low gear range. This allows more room to be dedicated to the higher gear range. The UX is available with the latest version of Lexus Safety System +, including a Pre-Collision System (PCS) developed to be able to recognize pedestrians at night. Additionally, PCS radar detection has been extended to enable detection of cyclists during the day―road users who are involved in a high number of traffic accidents2. The package provided on the UX also includes Lexus Co DRIVE (featuring Lane Tracing Assist and Adaptive Cruise Control), Automatic High Beam/Adaptive High-beam System, and Road Sign Assist3. Lexus took a new approach to achieve the best possible aerodynamic performance from the UX's rear combination lamps, wheel arch mouldings and, in a world first concept, aerodynamic wheels. Painstaking adjustments were made to the lamps' curved profile, with each change evaluated and verified in wind tunnel and real-world driving tests. The UX's aluminium wheels have a world-first aerodynamic design that helps both keep the brakes cool and reduce wind resistance. Computer simulations and wind tunnel testing produced a profile shape for the wheel's spokes that increased the amount of airflow that could be directed to cool the disc brakes, without compromising the coefficient of drag (Cd). The UX's air vents have a new single-knob control for air flow direction and volume, illuminated using a new wireless system. By combining the two functions in a single control, the vents could be made larger, improving performance. Each control has an LED light source that is powered wirelessly, using electromagnetic resonance between two coils vibrating at the same frequency. Using the same design principle as the LC's rear combination lamps, the vent lights use mirror optics to create the effect of floating lighting depth, even though the reflector element is only 3mm thick. Using the intelligence based on accumulated knowledge about a driver's behaviour, the system can predict when/where the vehicle is likely to slow down or stop. When UX is nearing a location where the driver has slowed or stopped in the past and the driver releases accelerator pedal, Predictive Deceleration Support triggers an increase in the amount of regenerative braking. This permits more efficient energy recovery and recharging of the hybrid battery. The system can provide deceleration support up to about 300m ahead of the vehicle. In stop-go and low-speed driving, there is greater use of the electric motor, making it more likely the level of hybrid battery charge will be depleted. In this driving scenario, Congestion SOC control uses traffic information gathered by the navigation system to determine if there is any congestion on the vehicle's planned route. If so, it actively charges the hybrid battery before reaching the area of congestion. This improves fuel efficiency by reducing the need of forced engine start to chargethe battery when driving in slow, congested traffic. The F SPORT models benefit from exclusive tuning of the suspension, with adjustment to both springs and stabiliser bars, and the use of rear performance dampers to provide accurate, stable and responsive handling. They are also available with a specifically adapted version of the new high-response Adaptive Variable Suspension system featured on the Lexus LC flagship coupe. The aim is to provide a level of damping force that contributes to a rewarding drive, but doesn't detract from comfortable ride quality. This damping force is reduced in straight line driving and increased when cornering or changing lanes to provide stability with minimal roll. Where AVS is fitted, its functionality is linked to the Sport S+ mode in the car's Drive Mode Select. 2Please inquire at your local dealer for details on the availability of features. 3Please inquire at your local dealer for details on the availability of features.